I want to share a home remedy recipe to treat acne and acne scars. If you browse at my beauty profile, I actually have combination skin. My t-zone is very oily and blackheads prone while my cheek area is dry. I used to have acne prone skin but my skin condition has improved over the years with the right products I have been using religiously and also with the help of h2o. Yes, water is crucial, not only it benefits your health but your skin as well! Then again, those acne and blackheads attacked me again while I was pregnant. At initial period of my pregnancy, my skin was congested with acne on my forehead, cheeks and even the chin area. I was so upset that I complaint so much. After which, my mom's friend suggested that I try egg mask facial. I was pretty skeptical initially because I do not believe using kitchen remedies on my skin but I decided to give it a try anyway because I could not stand looking into the mirror seeing those ugly red marks and fierce acne. And the results derived were surprisingly awesome! Some angry and bumpy acne reduced in size and red marks were lighten. e) a fan brush (optional). You can use your fingers. I find using a fan brush easier and faster. 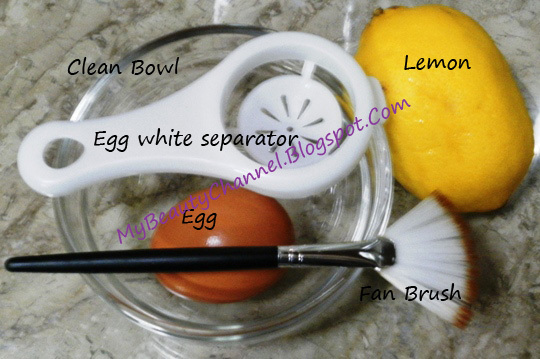 Crack the egg open and carefully separate the egg whites from the yolk in the first bowl. I use an egg white separator. With a clean fork, beat the egg whites hard until it is foamy. Then take a tablespoon of the egg white and put it into the second bowl. We are going to use this one tablespoon of egg white as a mask and yes, it is enough for one application. Squeeze 2 teaspoons of fresh lemon juice into the egg white and mix thoroughly. Make sure you clean your face before applying the mask. Using your fingers or a fan brush, apply the mixture onto your skin all over concentrating on the t-zone and chin BUT remember to avoid the eye area! Give it time to treat your skin. Egg whites give the skin a temporary face lift, whitening effect, constrict pores size and reduces acne size. The lemon juice will lighten acne scars. I usually wait for 10-15 minutes for the mask to dry. Now, rinse off and pat your skin dry. Your skin should feel firm, refreshed and smooth. Prick the egg yolk and apply an even amount on your face. The egg yolk is moisturizing and soothing. Wait for it to dry and rinse off. This step is optional. If you wish to skip this step, follow up with your regular toner and moisturizer after Step 2. I like to start fresh each time. Therefore, I normally leave the remaining egg whites and yolk in the kitchen for my mom to cook. However, you can keep it refrigerated for 3 days. I recommend using this mask 2 times a week for best results for those with oily acne skin. If you have dry acne prone skin, use this once a week. Try this mask and see the results. It is not only effective but it is easy to prepare and very inexpensive. Tip: You need to use this mask religiously for remarkable results. Please note that no remedies work overnight and results vary according to individual's skin condition.